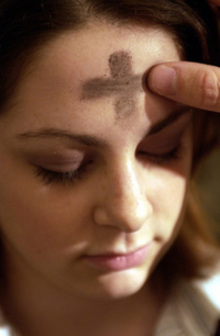 You'd think that growing up in the Episcopal church I would have understood Ash Wednesday by now. I am coming to appreciate what went unnoticed then. As Father Tony said on Wednesday night in his homily, Ash Wednesday is an invitation to remind us of our "creatureliness." Put another way - we are invited to "embrace our finitude." Maybe I understand this better now because I am in "mid-life" and realize my finitude and creatureliness now more than ever. And the crazy thing is that I was irritable much of this week because of this very finitude that I am now being invited to embrace. Irritable because I couldn't do it all, and others and myself were expecting me to do it all. How freeing to embrace my limited capacity today, to slow, linger, take deeper breaths and be okay with not finishing my to-do list that was completely unrealistic in the first place. Walter Wangerin Junior, in his brilliant Lenten devotional echoes this sentiment of Lent calling us to remember our finiteness and death. He writes, "That sounds old in a modern ear, doesn't it? Fusty, irrelevant, and positively medieval! Why should I think about death [and my finiteness and limitations] when all the world cries out 'Life' and 'Live' [and you can do it all! ]...didn't Jesus promise an abundant life?" (22). We don't want to be bothered by such "morbidity." Spend 20 minutes acknowledging your finite nature. God has created me with limitations. I cannot grant everyone’s wishes. I will have to depend upon others to accomplish certain tasks. I have limited knowledge and am prone to forget things that I have learned. I will frequently not accomplish all the goals I have set before myself in a day, week, year, etc.? What is my reaction to experiencing my limitations? Do I attempt to make a new plan to ensure I will prevail? Do I attempt to move on to something else that I know I can succeed at? Do I fabricate an answer to a question in order to maintain the appearance that I am all-knowing? Do I simply give up? What is the driving emotion behind these reactions? Do I experience deep anger, fear or sadness when I am faced with my limitations? So perhaps you can join me over this season - acknowledge your inability to do it all and live in the freedom that brings.